Many outdoorsmen love the peace and tranquility that one can achieve while fishing. It is an experience unlike many other outdoor activities; but as with all activities, you want to be as prepared as possible when you embark on your journey. GrabAGun has a vast inventory of all your fishing needs to make your next trip one to remember. Fishing doesn’t have to require a lot of equipment, but good equipment for the right purpose can help make the difference between a successful trip and one where you go home without catching anything. The right rod is arguably the first tool any good fisherman needs to have. GrabAGun has a variety to choose from based on your target fishing locations and styles. To accompany our fishing rods, we offer a grand catalog of reels to give you the cranking power you need to reel in the big fish. Combinations are also available, so you can be sure your rod and reel work succinctly whether it’s your first time out or you are a versed fishing veteran. Our online inventory also boasts fishing line, bait, sinkers, bobbers, and an assortment of other fishing accessories to make your chances of catching a fish the best they can possibly be. Once you have your fishing pole ready, you will want to outfit yourself with some of the best gear around. Waders are a convenient way to stay dry for stream fishing, and we carry some of the best on the market from all your favorite brands. Keep all of your tackle in one easy-to-access location with one of our tackle boxes. Once you make the big catch, you can see how large your fish really is with one of our many scales. You’ll have the precise details for story-telling time, and now there is no denying who caught the biggest fish. When it comes to outdoor equipment, GrabAGun is the premiere source for all of your gear. 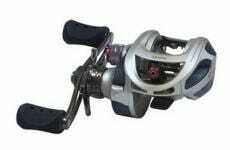 Let us help you get ready for your next fishing trip with some of the best fishing equipment available.